Suddenly, the little grasshopper became important to her. Her heart beat fast all the way home. When she got home at last, she was relieved to see that the grasshopper was still on the mirror. Once upon a time, a lady had to drive a long way into the big, noisy city to help with a fundraiser at the retirement home for elderly Japanese. She got into her car and was soon on the highway, driving very fast. She looked into her side mirror, as she often does, to check on traffic behind her. She was shocked by what she saw. 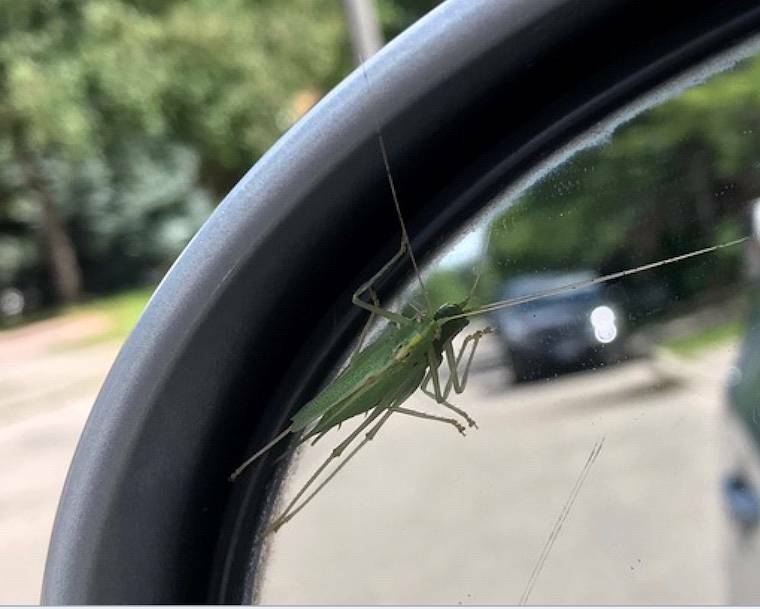 There, hanging for dear life onto the mirror was a fragile lime-green Katydid Grasshopper. It had wispy antennae which were longer than its body and legs as thin as threads. The wind buffeted the tiny creature, this way and that. But it never let go. Its antennae were waving wildly but never broke off. How could such thin legs hang onto a shiny surface when it was travelling over 100km/hour? The drive took over an hour. When the lady reached her destination, she forgot about the grasshopper. She came out a couple of hours later. She still didn’t think about the grasshopper until she was on the highway again. She looked into the mirror. There it was! Still hanging on. The lady was taken aback. She was amazed that it was still there. She hoped that it would not be blown away as it battled for its life. Suddenly, the little grasshopper became important to her. Her heart beat fast all the way home. When she got home at last, she was relieved to see that the grasshopper was still on the mirror. She expected it to leave but it still made no move to get off. Maybe it was so exhausted and frightened that it could not move. She decided that it could not stay on the mirror in the hot sun. She had to help it find a natural home. The lady got a stick and and gently nudged it so that it finally stepped onto the twig. Then she was alarmed for it fell to the road. The lady knew it might get squashed by a car, so she nudged it toward the grass. It hopped once. She nudged it again. Another hop. Finally. after several hops, it was on the grass and happily hopped under the bushes. The lady was thrilled. Usually she didn’t like insects, but she couldn’t help but admire how hard the grasshopper had clung to life. The moral of the story is twofold. First of all, we should all persevere to triumph under hardship and cling to life, which is a wonderful gift, just as the little grasshopper had done. Remember the perseverance the lady’s family showed in the past when they had lost their home, but never lost hope. Secondly, we should all have empathy for fellow creatures on our journey through life, even for a lowly grasshopper. By doing this, you will learn to have empathy for other people who are in trouble. Always remember the little Katydid Grasshopper who never gave up.